湖泊科学 2016, Vol. 28 Issue (1): 170-177. DOI: 10.18307/2016.0120. 曾海逸, 钟萍, 赵雪枫, 李超, 何小林, 刘正文, 热带浅水湖泊后生浮游动物群落结构对生态修复的响应. 湖泊科学, 2016, 28(1): 170-177. DOI: 10.18307/2016.0120. ZENG Haiyi, ZHONG Ping, ZHAO Xuefeng, LI Chao, HE Xiaolin, LIU Zhengwen. Response of metazoan zooplankton communities to ecological restoration in a tropical shallow lake. Journal of Lake Sciences, 2016, 28(1): 170-177. DOI: 10.18307/2016.0120. 摘要：热带浅水湖泊后生浮游动物群落以轮虫和小型枝角类为主, 往往缺乏大型浮游动物, 其影响因子还存在争议, 因此通过减少鱼类, 提高大型后生浮游动物密度, 从而增强对浮游植物的下行控制、修复热带富营养化湖泊的方法受到质疑.暨大南湖位于广州暨南大学校园内, 是热带富营养化浅水湖泊, 于2014年12月实施以鱼类去除和水生植被重建为主的生态系统修复工程, 以期改善水质.通过对南湖修复前后水质、后生浮游动物以及修复后鱼类群落的调查分析, 研究了后生浮游动物群落对修复的响应.结果表明:与修复前相比, 总氮、总磷和叶绿素a浓度显著降低, 透明度显著上升.枝角类丰度和生物量显著增加, 修复后初期出现较高密度的大型枝角类蚤状溞(Daphnia pulex), 桡足类丰度和生物量没有显著变化, 轮虫丰度下降而生物量上升; 后生浮游动物体长和生物多样性显著增加.随着鱼类密度的增加, 蚤状溞丰度快速降低, 后期鱼类减少后蚤状溞丰度又有所升高.因此, 本研究显示鱼类是控制热带浅水湖泊大型浮游动物种群的主要因素, 由于控制鱼类密度以维持较高大型浮游动物密度较为困难, 因此单纯生物操纵在热带浅水湖泊修复中难以取得显著效果. Abstract: The metazoan zooplankton communities were dominated by small cladocerans and rotifers, often lack of large-sized zooplankton in tropical lakes and the controlling factors are not clear. Thus it has been questioned if eutrophic lakes can be restored by reducing fish, increasing large-sized metazoan zooplankton, and the top-down control on phytoplankton in the tropics. South Lake from Jinan University, Guangzhou, is a tropic eutrophic shallow lake. The lake was restored via fish removal and plantation of submerged macrophytes in order to improve water quality. We monitored the water quality, metazoan zooplankton communities and fish before and after restoration in order to study the response of metazoan zooplankton communities to the restoration. 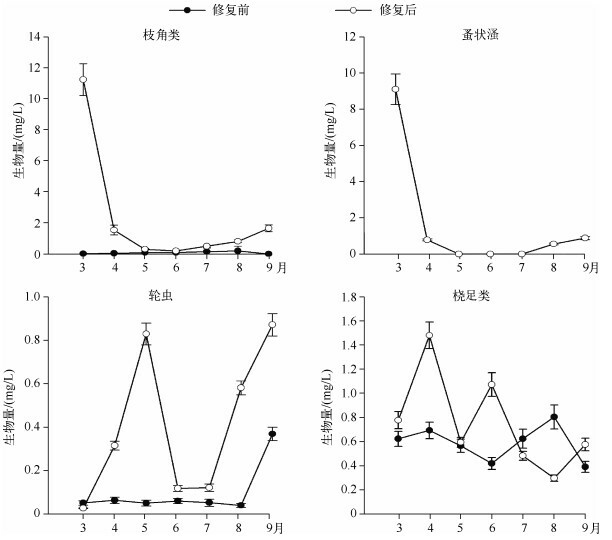 The results showed that total nitrogen, total phosphorus and chlorophyll-a concentrations decreased significantly and the transparency increased. The abundance and biomass of cladoceran increased, and high numbers of large-sized cladoceran Daphnia pulex were observed shortly after the restoration. The abundance and biomass of copepods had no significant changes. 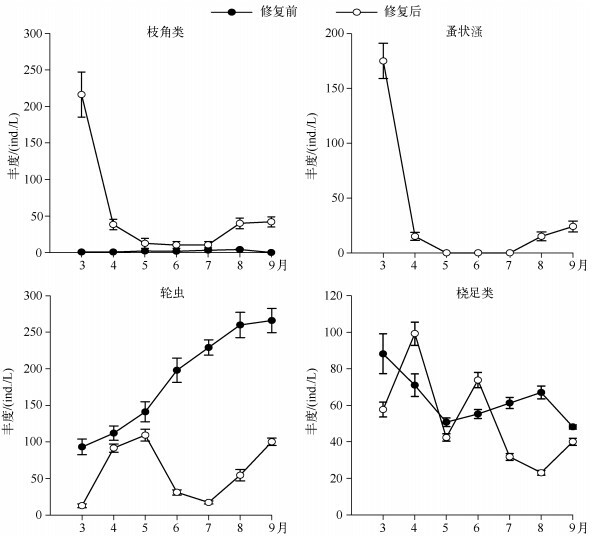 The density of rotifers decreased, but biomass increased. The sizes of metazoan zooplankton and biodiversity increased. 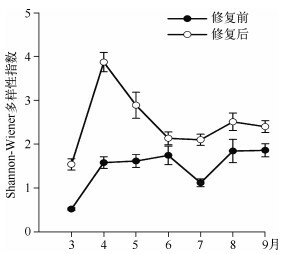 The abundance of Daphnia pulex decreased quickly when fish biomass increased, and increased again when fish biomass was reduced later. Therefore, this study suggests that fish is a key factor controlling the population of large-sized zooplankton in tropical shallow lakes. As controlling fish to maintain high densities of large-sized zooplankton is difficult, it is unlikely to achieve a significant improvement in the restoration of tropical lakes using only biomanipulation. 由氮、磷等营养盐的过度输入而引起的水体富营养化已成为世界上最受关注的水环境问题之一.近年来随着社会经济发展和人口膨胀，湖泊富营养化日趋严重.湖泊富营养化往往导致蓝藻过度繁殖形成水华[2 — 4]，使得水体透明度下降，生物多样性降低，生态系统的结构和功能严重退化.富营养化水体治理首先要削减营养盐负荷，包括点源和面源[6 — 7]，但是沉积物再悬浮和营养盐释放可形成较高的内源营养盐负荷，水质往往达不到预期的效果[8 — 10].温带湖泊的研究表明，通过生物操纵大幅减少食浮游生物鱼类密度，可以提高大型浮游动物密度，有效控制浮游植物的生长，改善水质[11 — 12].因此，生物操纵方法已成为温带富营养化湖泊修复的主要手段之一. 位于广州市暨南大学内的南湖(23°07′N, 113°20′E)是个人工湖，建于1958年，面积为4000km2，平均水深约1.0m.由于周围生活污水和地表径流的污染，水体富营养化严重.为彻底整治南湖，于2013年初进行了截污，2014年1月实施了以鱼类去除和沉水植物群落重建为主的生态修复工程：首先去除浮游生物食性鱼类和底栖杂食性鱼类，包括罗非鱼(Oreochomis sp. )、鲤(Cyprinus carpio)和鲫(Carassius auratus)等；种植了沉水植物，包括苦草(Vallisneria natans)、轮叶黑藻(Hydrilla verticillata)及穗花狐尾藻(Myriophyllum spicatum)等，其中以苦草为优势种，覆盖率在2月份约为25 %，9月份增至约85 %. 轮虫按照《中国淡水轮虫志》鉴定；浮游甲壳类按照《中国动物志》[24 — 25]鉴定.根据浮游动物体积的近似计算公式[26 — 27]，测定轮虫、枝角类和桡足类的体长、体宽或直径等以计算每个个体体积，并认为浮游动物的密度与水(1g/ml)相同，从而得出每个个体的体重，最后计算浮游动物的生物量. 共检出轮虫20种，其中修复前8种，优势种属包括臂尾轮虫(Brachiormssp. )和热带龟甲轮虫(Keratellatropica)；修复后水体中检出17种，优势属为多肢轮虫(Polyarthra sp. ).裂足臂尾轮虫(Brachionus diversicornis)、镰状臂尾轮虫(B.falcatus)和蹄型腔轮虫(Lecane ungulata)仅在修复前出现；检出浮游甲壳动物9种，其中修复前3种，优势种为模糊秀体溞(Diaphnnosoma dubium)和台湾温剑水蚤(Thermocyclops taihokuensis)；修复后检出9种，优势种包括蚤状溞(Daphnia pulex)和台湾温剑水蚤.蚤状溞、奥氏秀体溞(Diaphanosoma orghidani)、角突网纹溞(Ceriodaphnia cornuta)、长额象鼻溞(Bosmina longirostris)和奇异尖额溞(Alona eximia)仅在修复后出现，未发现哲水蚤. 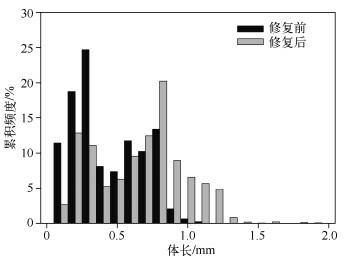 修复后枝角类丰度及生物量显著高于修复前(P＜0.05)；轮虫丰度显著低于修复前(P＜0.05)，4月份开始生物量显著高于修复前；修复前后桡足类无显著变化(图 2、3).修复后3月初开始，蚤状溞大量出现，直到5月初逐渐消失，9月初蚤状溞再度出现，但丰度较低，保持在15~30 ind./L左右(图 2).对后生浮游动物多样性分析可知，修复后浮游动物Shannon-Wiener多样性指数显著高于修复前(P＜0.05)(图 4). 修复前浮游动物体长分布在0.1~1.1mm，平均体长为0.69mm；修复后体长则分布在0.12~2.0mm，平均体长为0.71mm.其中修复前浮游动物体长主要分布在0.1~0.8mm，其中体长＜0.6mm的个体占76 %.而修复后体长主要分布在0.2~1.2mm，其中体长>0.6mm的个体约占56 % (图 5). 与温带湖泊相比，热带湖泊中鱼类个体较小、食浮游动物鱼类比例较高.暨南大学南湖修复后出现的鱼类以小型罗非鱼和鲫鱼为主，这些鱼类繁殖速度快，而且一年繁殖多次，幼鱼数量全年较多，浮游动物是其主要食物，尤其喜食大型浮游动物.修复后浮游动物体长有所增加，说明浮游动物所受到的捕食压力小于修复前.修复后暨大南湖轮虫丰度下降，而生物量上升，主要是因为轮虫个体增大，而个体增大无疑与鱼类捕食压力下降有关.桡足类逃避鱼类捕食能力较强，因此其密度的变化往往与鱼类密度关系不大，这可能是导致南湖修复前后桡足类差别不显著的主要原因.大型枝角类蚤状溞只在初期丰度较高，后期密度很低，这主要是鱼类群落快速恢复造成的.许多研究表明，热带鱼类种类比温带丰富，大型肉食性鱼类较少，杂食性鱼类往往占优势.同时，由于热带湖泊水温常年较高，许多鱼类都能够全年繁殖[38 — 39]，暨南大学南湖修复后渔获量(重量)增加小于数量增加的趋势(图 6)，主要是个体较小的鱼类比例上升，而小个体鱼类对浮游动物的捕食压力较高.Jeppesen等认为热带湖泊中小个体杂食性鱼类占据优势且常聚集在沉水植物植被区，这些鱼类大量摄食浮游动物，尤其喜食大型浮游动物，水生植物群落起不到保护大型浮游动物庇护所的功能，因此对浮游动物的捕食压力常年较高.本研究中于8月底调整了捕鱼方法，对鱼类进行大量捕捞后，蚤状溞再度出现(图 2)，这说明在热带浅水湖泊中，鱼类是控制大型浮游动物种群变化的关键因素之一.Iglesias等也发现在亚热带湖泊中鱼类的去除可以导致溞属等大型浮游动物重新出现. Schindler DW. Recent advances in the understanding and management of eutrophication. Limnology and Oceanography, 2006, 51(1): 356-363. Jeppesen E, Jensen JP, Kristensen P et al. Fish manipulation as a lake restoration tool in shallow, eutrophic, temperate lakes 2:threshold levels, long-term stability and conclusions. Hydrobiologia, 1990, 200: 219-227. Jeppesen E, Jensen JP, Søndergaard M et al. 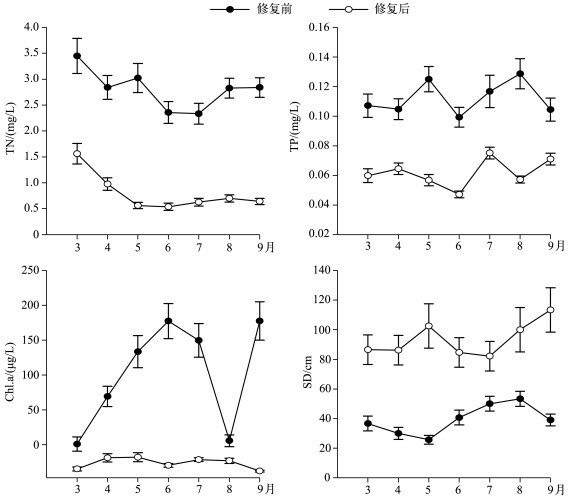 Top-down control in freshwater lakes:the role of nutrient st-ate, submerged macrophyte sand water depth. Hydrobiologia, 1997, 342: 151-164. Lauridsen TL, Jensen JP, Jeppesen E et al. Response of submerged macrophytes in Danish lakes to nutrient loading reductions and biomanipulation. Hydrobiologia, 2003, 506: 641-649. Carpenter SR. Eutrophication of aquatic ecosystem:bistability and soil phosphorus. PNAS, 2005, 102: 1002-1005. Moss B, Madgwick J, Phillips G. A guide to the restoration of nutrient-enriched shallow lakes. UK: Broad Authority & Environment Agency, 1996, 1-179. Jeppesen E, Søndergaard M, Lauridsen TL et al. Biomanipulation as a restoration tool to combat eutrophication:recent advances and future challenges. In:Woodward G ed. Advances in ecological research. New York:Elsevier Academic Press Inc, 2012, 47:411-488. Meijer ML, De Boois I, Scheffer M et al. Biomanipulation in shallow lakes in the Netherlands:an evaluation of 18 case studies. Hydrobiologia, 2003, 408/409: 13-30. Beklioglu M, Meerfhoff M, Søndergaard M et al. Eutrophication and restoration of shallow lakes from a cold temperate to a warm Mediterranean and a (sub)tropical climate. Eutrophication:causes, consequences and control. Dordrecht:Springer Netherlands, 2011:91-108. 陈光荣, 刘正文, 钟萍等. 热带城市湖泊生态恢复中水生植被、浮游动物和鱼类的关系研究. 生态环境, 2007, 16: 1-7. 黄祥飞. 湖泊生态调查观测与分析. 北京: 中国标准出版社, 1999. 王家楫. 中国淡水轮虫志. 北京: 科学出版社, 1961. 蒋燮治, 堵南山. 中国动物志·淡水枝角类. 北京: 科学出版社, 1979. 沈嘉瑞. 中国动物志·淡水桡足类. 北京: 科学出版社, 1979. 章宗涉, 黄祥飞. 淡水浮游生物研究. 北京: 科学出版社, 1991. 陈雪梅. 淡水桡足类生物量的测算. 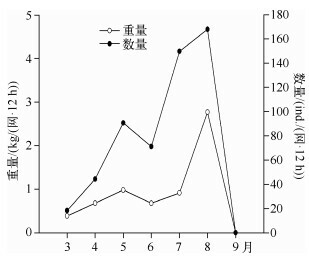 水生生物学集刊, 1981, 7(3): 397-408. 潘炯华, 钟麟, 郑慈英等. 广东淡水鱼类志. 广东: 广东科技出版社, 1991. Lazzaro X. Do the trophic cascade hypothesis and classical biomanipulation approaches apply to tropical lakes and reservoirs?. Verhandlungen-Internationale Vereinigung für theoretische und angewandte Limnologie, 1997, 26: 719-730. Jeppesen E, Sondergaard M, Mazzeo N et al. Lake restoration and biomannipulation in temperate lakes:relevance for subtropical and tropical lakes. In:Reddy V ed. Tropical eutrophic lakes:Their restoration and management(in press), 2006. Lévêque C. Biodiversity dynamics and conservation:the freshwater fish of tropical Africa. Transactions of the American Fisheries Society, 1997(1): 182-183. Paugy D, Le'vêque C. La Reproduction. In:Paugy D, Le'vêque C eds. Les poisons des eaux continentales africaines:Diversite', e'cologie, utilisation par l'homme. Paris:IRD Editions, 1999:129-152. Kalff J. Limnology-Inland water ecosystems. New Jersey: Upper Saddle River, Prentice-Hall Inc, 2002. Fernando CH. Zooplankton and tropical freshwater fisheries. Leiden: Backhuys Publishers, 2002, 255-280.